21 Dec Out Damn Spot! There are as many ways to remove backscatter as there are to shoot it, but the technique I’m about to show you is one of my favorites for a quick and relatively easy fix. I learned it first from Photoshop guru Eddie Tapp, and although a few versions of Photoshop have come and gone since then, it still remains as apt as ever. 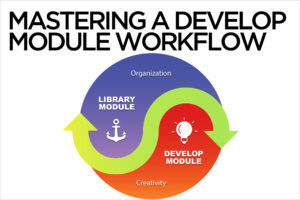 This technique’s effectiveness varies with every image, and it works best when there’s not a lot of detailed information in the background. Before you start, make sure you can see your History Panel. If it’s not visible, go to Menu>Window>History, and make sure that History is checked on. 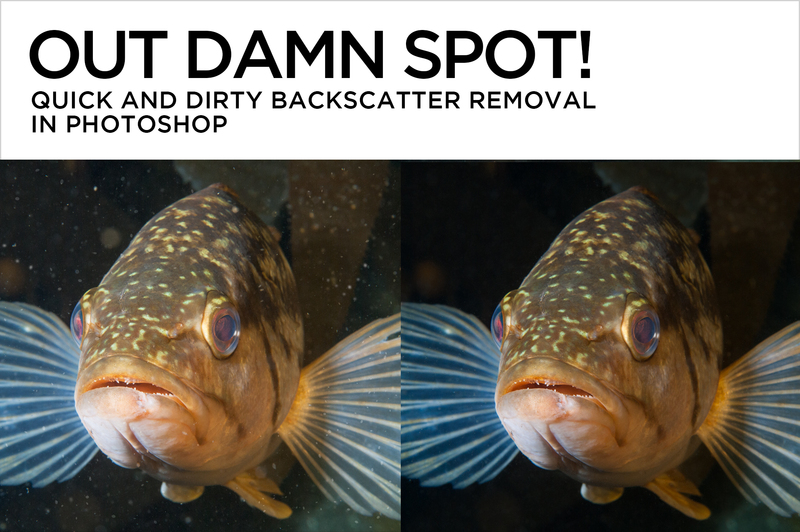 Zoom in to at least 100% on an area in your image with obvious backscatter. You can double-click on the zoom tool to get there, or use the keyboard shortcut Opt-CMD-0 (Mac) or Alt-CTRL-0 (PC). Hold the space bar down to temporarily access the Hand Tool, then continue holding it down while you click and drag to move around your photo. Look for a medium-sized piece of backscatter to target. Go to the filter menu and select Noise>Dust and Scratches. In the ensuing panel, reset both sliders to their lowest value all the way to the left. Radius should read 1 and Threshold 0. 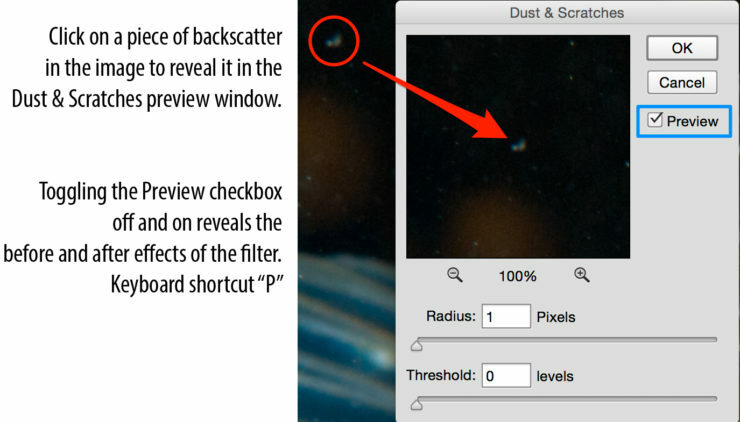 Click in your image on the piece of backscatter that you located earlier, and you’ll see it appear in the Dust & Scratches preview window. Move the Radius slider to the right until the spot has completely disappeared. 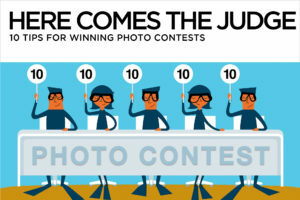 Check your image. If there’s still a significant amount of backscatter, nudge the slider a little further to the right until most of it’s gone. Ignore any large or blurred particles – you’ll fix those later. Move the Threshold slider slowly to the right just until the spot begins to reappear, then back it off until you can’t see the spot or any edges surrounding it. The Radius slider removes offending particles, and the Threshold slider restores grain. 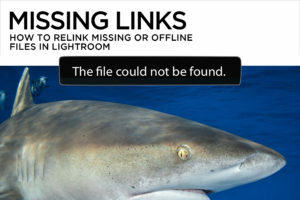 Check your image closely to make sure there are no artifacts or edges remaining. Toggle the Preview checkbox in the Dust & Scratches window on and off to see a before and after version of your image. You can also use the keyboard shortcut “P” for “Preview”. 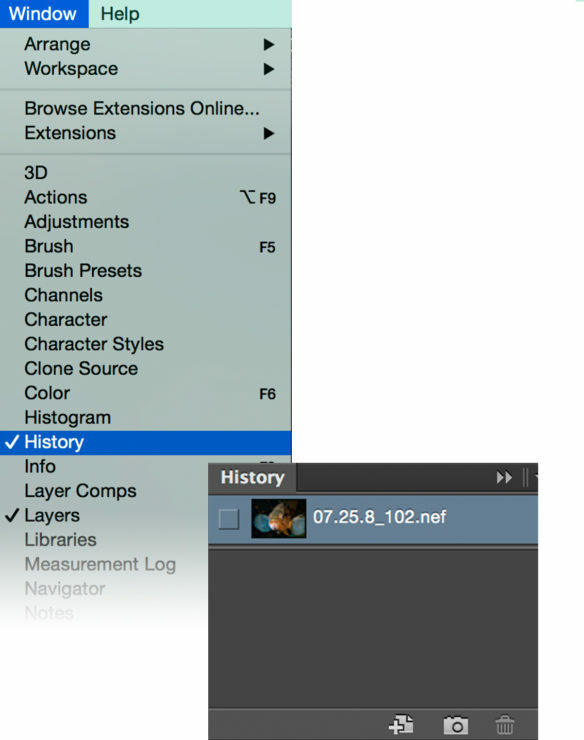 Even though the entire image appears blurred, click OK.
Take a look at the History Panel. 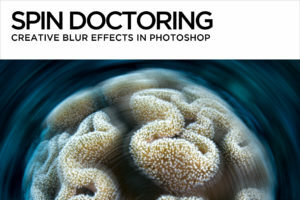 It tracks your edits in Photoshop, starting with the opening state of your image. Right now, the last step on the list should be “Dust & Scratches”, since that’s the last thing you did. 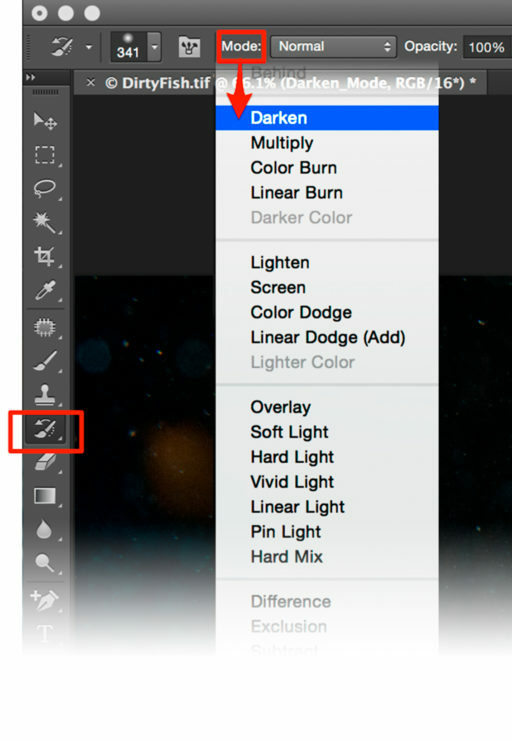 The “Dust & Scratches” step should also be highlighted (the default color is light blue) to show that it’s selected. Look immediately to the left of the “Dust & Scratches” step and you’ll see a small empty box. Click in it to set that step as the source for the History Brush. You should see a teensy icon of a brush with an arrow in the box. Now click on the layer immediately above “Dust & Scratches” to select it. 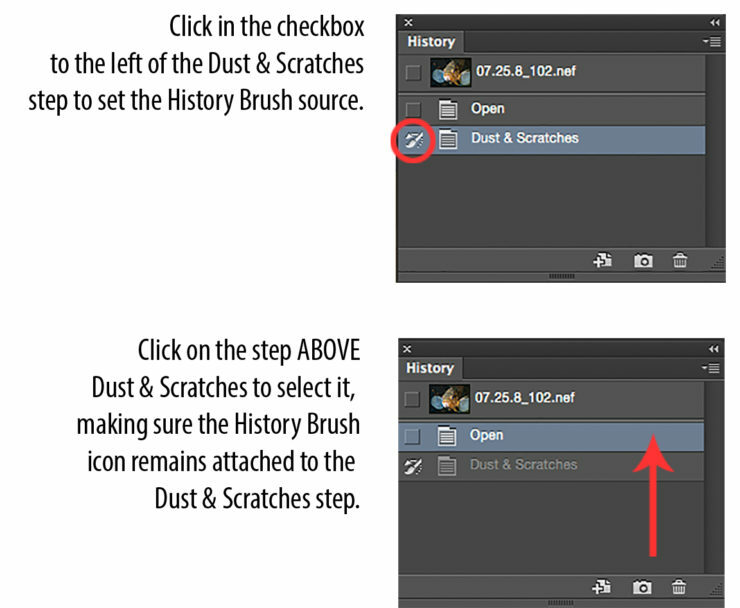 The History Brush source icon should next to the “Dust & Scratches” step. All the work you’ve done will vanish, and you’ll see the image as it was before you opened the Dust & Scratches filter. DON’T FREAK OUT! Select the History Brush from the Tool Panel. It looks just like the little icon next to the “Dust & Scratches” step in the History panel. Make sure you have the History Brush Tool and not the Art History Brush Tool. Set the mode to Darken. Wherever you use it, the History Brush will revert your image to the Dust & Scratches state you selected in the History Panel. Use a large, soft brush at 100% opacity to restore the effects of the Dust & Scratches filter, changing to a smaller more precise brush as you get closer to areas of sharpness or detail. The right and left bracket keys ( [ and ] ) make the brush bigger or smaller, and holding down the shift key while using them changes the hardness or softness of the edge. If you make a mistake, tap CMD-Z (Mac) or CTRL-Z (PC) to undo. OPT-CMD-Z or ALT-CTRL-Z will continue step backward. You can also undo by selecting progressively earlier steps in the History panel. 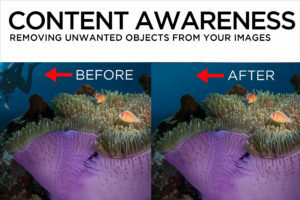 Check your image for stubborn spots and telltale signs of editing. Whenever you do lots of backscatter removal, you run the risk of leaving flat spots without grain, or blurred edges that were inadvertently painted over with the History Brush. Use the Spot Healing Brush, Clone Stamp and Patch Tool to finesse any boo-boos.